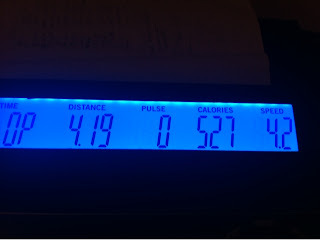 After a long debate with myself on switching my off day to today instead of tomorrow this week, I finally drug myself onto the treadmill around 7:30pm. Honestly, I would have rather dragged myself to bed. For entertainment tonight, yes I needed something to entertain me while I walked on the treadmill, I decided to attempt watching a movie on Bre's iPad. While this did seem to make my time go faster, overall I was not entertained. Logged onto xfinity, picked a movie, hit play...it starts! Bonus..it freezes, ummm ok, well I don't have any place to go since I am walking in place on a stupid treadmill, so I will wait for it to 'unfreeze'. Lack of patience, I find another movie, and wouldn't you know it...same thing, Hit play, it starts, a few minutes later, it freezes, and then black screen! Hmmm maybe the battery is dead, cause of course I didn't check that first! NOPE, there is little over 50% battery remaining, no big deal, find another movie...scroll, find, hit play, start, freeze, black, freeze, play, freeze, play freeze, I am NOT finding another movie...play, freeze, play, freeze, and finally my time on the treadmill is over. Whoo hoo! Today's workout results: 4.19 miles in 60-minutes averaged a 14:19 pace.